Home » family » Having Fun with the #CheeriosChallenge ! “This is a sponsored post on behalf of Life of Dad and Cheerios. As a Dad, my life is one big balancing act. I feel lucky to have two beautiful ladies under the age of six. However, it is a relentless and oddly beautiful combination of sleepless nights, unexplainable potty training disasters, a myriad of home and work responsibilities, uncontrolled laughter, and brief moments of quiet time with my wife when the kids fall asleep at night. When I think of balancing acts, the #CheeriosChallenge is one of the most enjoyable challenges I’ve ever seen on social media. It’s simple, fun and accessible to anyone with a camera and a box of Cheerios. Over the last few weeks, I’ve realized that the Cheerios Challenge is much more than a viral challenge, but also represents the science of fatherhood. It’s time for a little science class y’all. Get your pencils out. In chemistry, the Law of Conservation of Mass states that when you write an equation for a chemical reaction, the two sides of the equation should balance — you need the same number of each kind of element on both sides. If you carry out a chemical reaction and carefully sum up the masses of all the reactants, and then compare the sum to the sum of the masses of all the products, you see that they’re the same. This concept also applies to successful parenting and stacking Cheerios. Maintaining a good balance and constant recalculation is the key to success. Who knew it was so simple? For me, this balanced approach defines my definition of fatherhood and is a tenet of great parenting. To be successful, I need to handle of my responsibilities and quickly overcome challenges in a way that doesn’t disrupt the precious family dynamic. I need to be able to change both a tire and a diaper with ease, plan a fun family trip, manage finances, comfort the kids in their time of need, eat healthy, attend school functions, and stack Cheerios like a champ! That was one of the reasons why I enjoyed participating in the #CheeriosChallenge. It is a fun and lighthearted way to celebrate the joys of parenthood. Simply stack Cheerios on your child or anything (or anyone) else that will stay still long enough for a great photo. In addition to maintaining balance, fatherhood is about being able to give and receive love. I will continue to shower them with unconditional love. I want my daughters to grow into confident and passionate young women who have the confidence to follow her dreams and the tools to live her life with purpose and passion. I am so grateful to call you friend, but blessed to call you brother. You have helped me through some of the hardest points of my life. You always have a listening ear, an open heart, and words of advice. Your love, devotion, and respect towards your wife did something more important than any words could do – it reminded me that I am worthy of love and that I have value. I guess where I’m going is that I know with every fiber of my being that you will be an amazing father to two beautiful girls. Don’t let life overwhelm you or become too important that family becomes second, third, or even fourth. I know, I know, you sit there and say, “That will NEVER happen!” And honestly, it may not, but as the girls get older, a few excuses can turn into a habit of overbooking, shortened time, and jumbled schedules. In the era of poorly written emails and syntactically inept text messages full of emojis, it was such a treat to receive a heartfelt note from someone I’ve known and deeply care about. As started reading this letter, her words reminded me of the incredible responsibility and influence a father has on a young woman’s life and that although sometimes I feel more like that collapsed stack of Cheerios when things don’t work out perfectly, I still am moving in the right direction. So now it’s your turn to see how well you can balance things. I am excited to be working with Life of Dad and Cheerios to help spread the word about the #CheeriosChallenge. 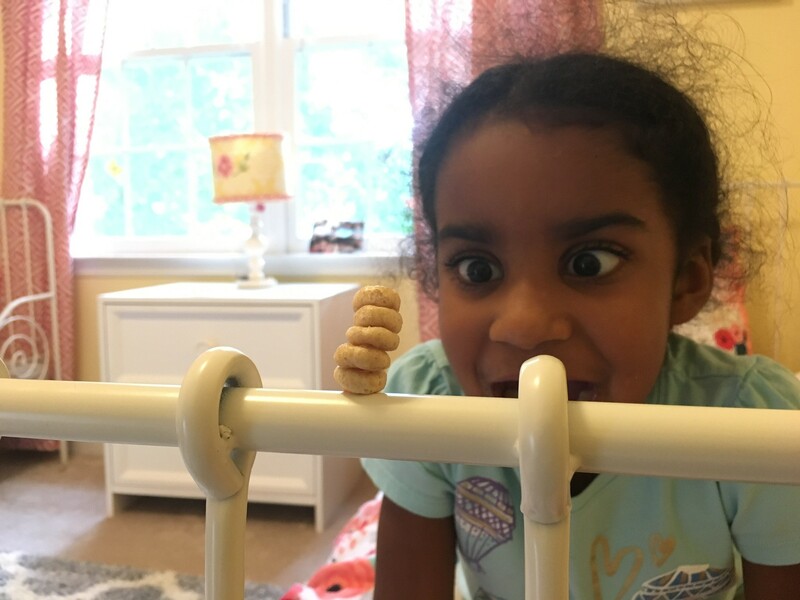 Take a creative photo with some stacked Cheerios and use the hashtag #StackingSweepstakes on Facebook, Twitter, or Instagram and be entered to win an awesome Father’s Day vacation to Mall of America!